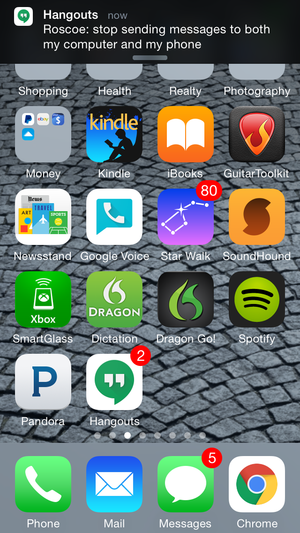 Editor's note: To be fair to Google Hangouts, Skype has its problems, too. But it's Google Hangouts that PCWorld's editors have, for several years, tried and largely failed to use for staff meetings with remote users. Just when we think we've figured out all the kinks, something else goes awry. So we feel our readers' pain on this one, and that's why we asked videoconferencing expert Christopher Null how to cure five of its most notable headaches. Did we miss a Hangouts hangup that's making your life hellish? Let us know in the comments. Sorry, Metro fans! Launch your browser from the Windows desktop in order to use Chrome. 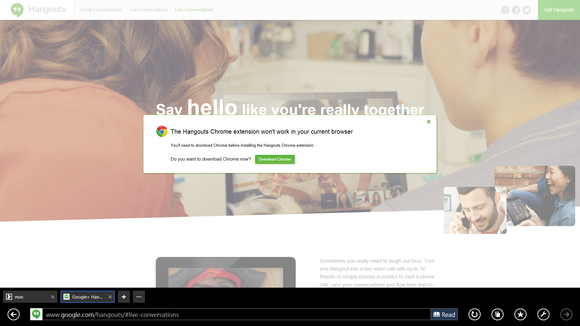 If you’re using the Start screen to launch Internet Explorer, you may find that Hangouts simply doesn’t work. That’s because Hangouts requires a plug-in to operate on IE, and the full-screen, Metro-style version of IE doesn’t allow any plug-ins at all. To work around this, you have a couple of choices. You can run IE in Desktop mode by launching it from the desktop instead of the Start screen, and then install Hangouts, or you can simply switch to another browser. Stem the flood of notifications by closing the Hangouts app or signing out. If you have Hangouts open on your desktop and your phone simultaneously, notifications will pop up on both devices, even if you aren’t actively engaged with one of them. This is unfortunately a known issue with Hangouts. It's a pain for some users, while other users actually prefer it to work this way. If you're getting too many notifications, a few solutions are available. First, you can sign out of Hangouts on devices or browsers form which you don’t want notifications, or close the app altogether. On Android devices, you have a few more options. You can use Menu > Snooze notifications to suspend alerts on that device. Notifications can also be suspended indefinitely on a per-user basis by selecting the gear icon in a Hangout window and unchecking the Notifications box there. This is a specific issue related to Hangouts on certain Android phones when pictures are sent over MMS. Many users report that the problem is erratic and that clearing application data from the Android Applications Manager may help, at least some of the time. The more reliable solution is not to use the camera within Hangouts to snap photos, but to take pictures separately, using the standard Android camera. When portrait photos are attached from your photo library, they seem to come through with the proper rotation intact. 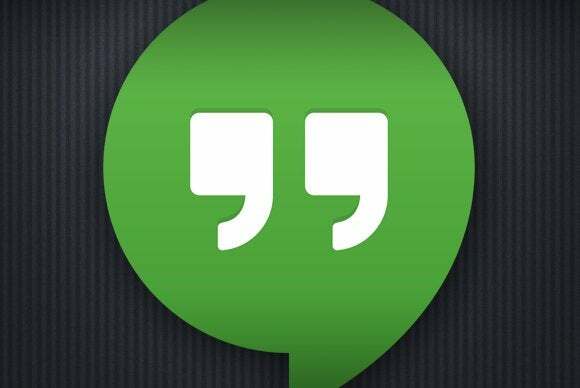 While there are many potential reasons that Hangouts won’t initiate a video call, here are a few of the most common troubleshooting tips. First, the Chrome browser doesn’t require a plug-in for Hangouts to work… unless your company uses Google Apps, in which case you will still have to install the Hangouts plug-in to make video calls. It’s also a good idea to install the Hangouts Chrome app, which adds Hangouts to the Chrome App Launcher, where you can initiate a new video call. Finally, in general, restarting your browser and/or your computer is also a good cure-all for any video-related problem within Hangouts. You can also try uninstalling this plug-in (instructions can be found here) and reinstalling it. Remember that the Hangouts app is different from the Hangouts plug-in. (You don’t need the former, but all browsers except Chrome require the latter.) If the Hangouts app has vanished from Chrome, simply re-enable it by re-downloading it from the Chrome Web Store.